NHDC Office in Letchworth Garden City was an old courtyard style building with buildings on 4 sides covered with a metal roofing system laid to a low pitch and suffering from water ingress. The project involved a major refurbishment of a 1970s office block to enable council services to be brought in from scattered locations in to single occupancy. The main roof areas and glazing were the two major failing elements of the old building. 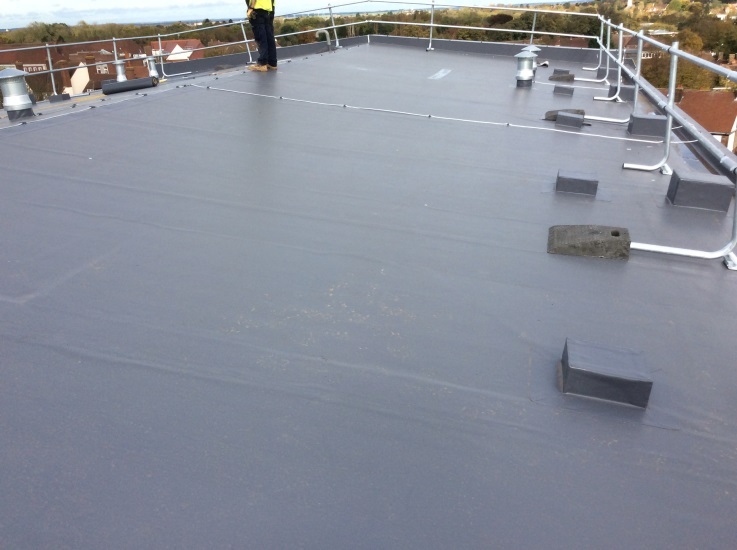 The client proposed an over-roof solution by installing an 18 mm ply secured through the existing metal deck back to the secondary roof structure and suggested using single ply membrane for the waterproofing layer. Working closely with Delomac Roofing, the correct options were discussed and priced and the IKO Armourplan PSG roofing membrane was specified thanks to its flexibility and extended guarantee offer. 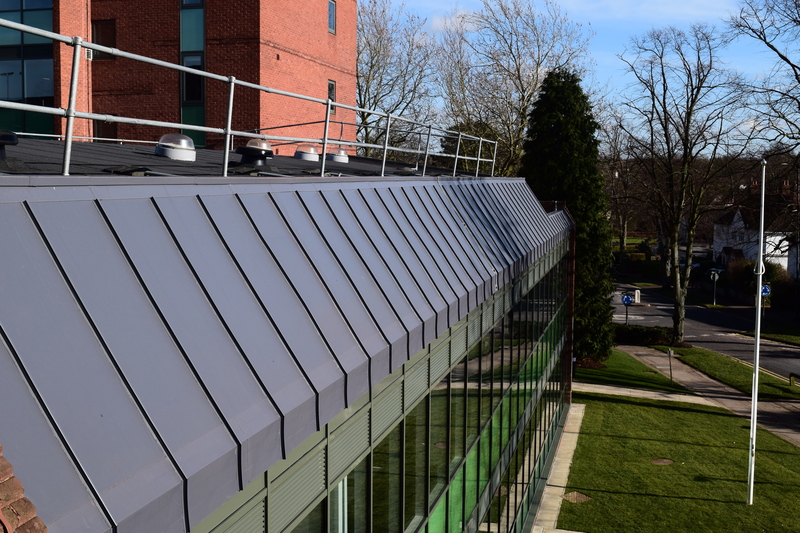 Replacement of the existing metal standing seam roof system meant that the new alternatives had to reflect the same appearance to keep the original look of the building. The building survey highlighted a woodwool slab base and suggested that any works would require a removal of the base to allow a secure roofing system. The head of the glazed facades was originally detailed with a failing metal mansard dressing and had slipped off allowing major water ingress into the building. Working closely as part of Willmott Dixon’s Supply Chain Network, Delomac Roofing and IKO Polymeric carried out a more detailed appraisal to review the initial specification, and were able to offer an overlay specification, securing the plywood overlay to the woodwool – obviating further building exposure and potential waste to landfill. Whilst the main area was simply detailed, perimeter and mansard details were a lot more complex as they involved cleaning cradle plinths, creating multiple service penetrations and ensuring a crisp building line is maintained on the external facades. IKO Polymeric Armourplan PSG membrane and colour matching standing seams were installed to a very good standard on mansard details. Armourplan PSG is a membrane unique to IKO Polymeric. With its superior reinforcement and the use of premium quality PVC throughout, the membrane’s unique formulation provides ease of installation. 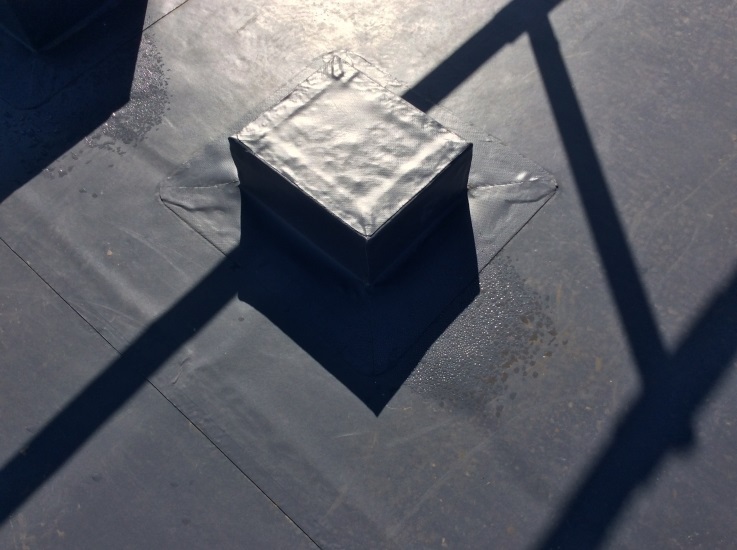 The extra flexibility of the membrane helped the installers of Delomac Roofing to achieve the desired tight and crisp details on the standing seams. Pipe details were also installed to the highest standard by using IKO Armourplan G detailing membrane. Potential waste to landfill was dramatically reduced by retaining existing deck and using the woodwool as contributor to the required thermal upgrade. All works were completed to a tight programme schedule despite a particularly wet summer. IKO Polymeric supplied the whole roofing system for this refurbishment project including VCL, thermal insulation, single ply membrane, membrane and insulation adhesives, fixings and fasteners and also rainwater outlets which provided the client a single point guarantee of 25 years.